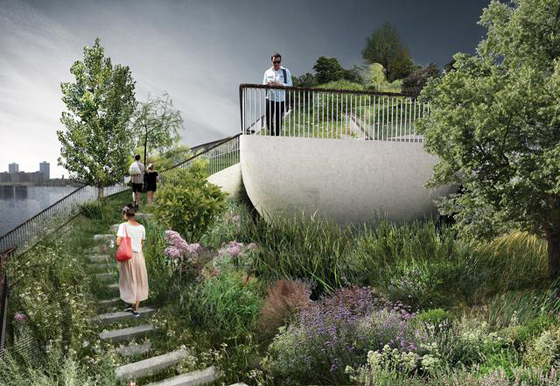 * The park’s parallelogram-shaped platform would sit atop 300 mushroom-shaped concrete columns that are to range in height from 70 feet above the water to 15 feet above, roughly the minimum required post-Hurricane Sandy. * The undulating form is not merely a design feature, but an attempt to address environmental issues in an area of the Hudson designated as a marine sanctuary and spawning ground for striped bass. The platform’s height would allow sunlight below and would also guard against storms. 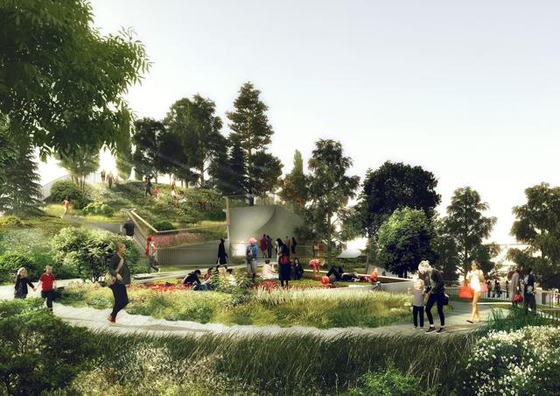 *The biggest performance space planned for the park could accommodate up to 1,000 people in seats and another 2,500 on a lawn. Other sections would hold an 800-seat amphitheater and a small stage with 250 seats. If the project is approved, construction could begin next year with an expected completion date of 2018 or 2019.